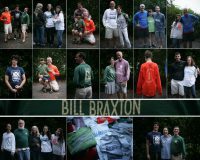 Bill Braxton’s family, close friends, coaches, and The Philadelphia Girls’ Rowing Club are proud to present the 44th annual rowing of the Bill Braxton Memorial Regatta. After a long history on the Schuylkill River in Philadelphia, the Regatta is now held at Mercer Lake in Windsor Township, NJ. We are looking forward to an outstanding experience for the crews and their families. The Bill Braxton Memorial Regatta honors the spirit of Bill Braxton, who was killed in an auto accident after his sophomore year at Marietta College. Earlier that year, 1973, Bill and his Lightweight 8 crew went undefeated and won the Dad Vail Regatta. The Bill Braxton Memorial Regatta stands for the selfless dedication of the true oarsman, one who holds the true spirit of competition as a healthy, integral part of life. Proceeds from the Regatta fund two scholarships, awarded to deserving high school rowers to help pay for college education. The Bill Braxton Memorial Regatta is the final regatta of the season. One never knows quite what to expect: rowers have competed in slush and snow, in rain, and under sunny skies. In one year rowers may wear long underwear and pogies, in the next they may row in t-shirts. So come out to support this great cause on Sunday, November 12, 2017.